Cytokines (e.g., interleukins and interferons) are small signaling proteins that are essential for communication between cells. They are important regulators of the immune system, helping to control lymphocyte development and function, orchestrate inflammation, and defeat microbial and viral invaders. But they also play important roles in the nervous system, embryonic development, and diseases such as cancer. Written and edited by experts in the field, this collection from Cold Spring Harbor Perspectives in Biology covers the spectrum of cytokines that are produced and their roles in normal physiology and disease. The contributors examine the numerous cytokines and their cognate receptors, the downstream signaling mechanisms (e.g., JAK-STAT pathways) that mediate the effects of cytokines on cells, and the regulators that keep them in check (e.g., long noncoding RNAs and the SOCS and IRF protein families). These molecular interactions are discussed in the context of their physiological effects; the roles of cytokines in the development and activities of the immune system are emphasized. The authors also explore how the actions of cytokines may be modulated for treating patients with autoimmune disorders, immunodeficiency, infections, allergies, and cancer. 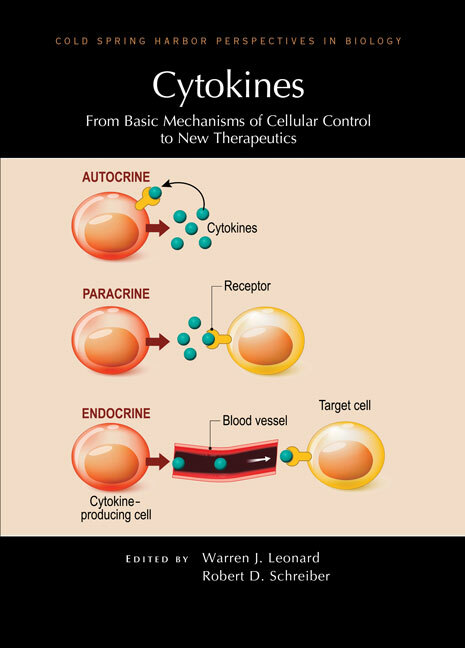 Thus, this volume is an indispensable reference not only for cell biologists and immunologists but for all who are interested in targeting cytokine signaling for therapeutic purposes.